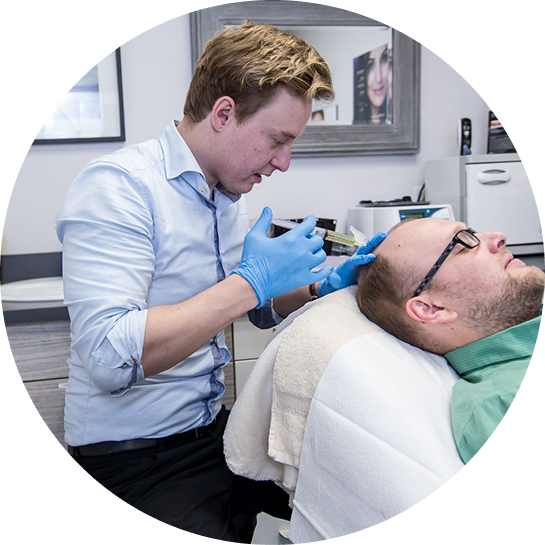 Platelet Rich Plasma (PRP) is a newly evolving non-surgical therapeutic hair restoration procedure for individuals suffering from androgenic alopecia (common male and female pattern baldness). It works by utilizes your own growth factors in a very high concentration to stimulate inactive (telogen) hair follicles into an active growth phase leading to new hairs. The growth factors also simultaneously increase the microcirculation which provides more nourishment to existing hair cells leading to an increase in the thickness of existing hairs. PRP works by stimulating newly implanted or inactive hair follicles into an active growth phase. Your blood contains small cells called platelets that help stop bleeding. Platelets also contain specific growth factors that when “activated” promote tissue regeneration and healing. These same growth factors may help hair grow or slow hair loss. Blood is drawn and then spun in a centrifuge, which has the effect of separating the platelet rich plasma from the rest of the blood. Local anesthesia is administered to the scalp so the patient feels no pain. The platelet rich plasma is then injected into the scalp. No sedation or medication is required. Early data suggests a regime of every nine to eighteen months is needed to achieve optimal stimulating results. What results can I expect from platelet rich plasma therapy for hair loss? Individual results vary. Extensive clinical studies are pending but the current medical literature contains numerous optimistic results. PRP should not be considered a “cure” for hair loss and no guarantee can be made about its individual effectiveness. PRP is not FDA-approved at this point in time.